Post by Pastor Tim – Last Friday night, my whole family (my wife and three young kids included) went to a soup kitchen and ate dinner alongside of the poor and homeless. That’s right, you read it correctly, we didn’t go to serve the homeless, we went to eat with them. We’ve participated in a few homeless outreaches before, but never have we simply eaten with them. A few weeks ago, Pastor Foley wrote about the most neglected Spiritual Discipline being that of Eating with the Poor. It’s easy to get this confused with giving to the poor, caring about the poor or even serving the poor but that wasn’t what he was referring to. 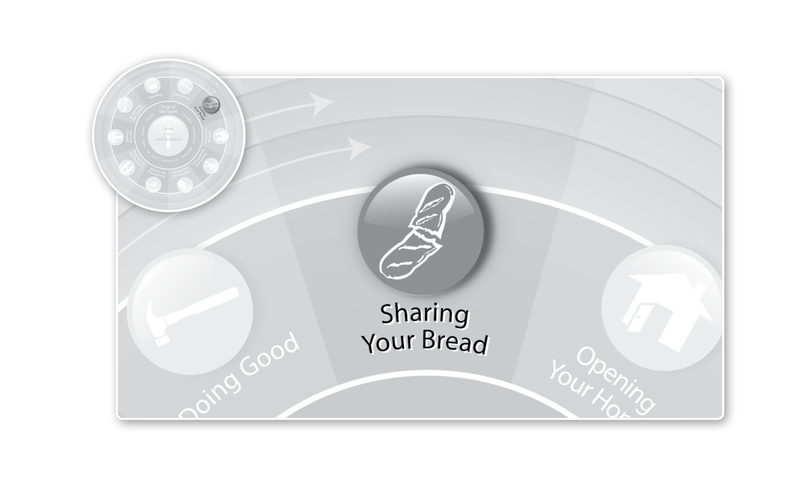 Especially in this month of focus on sharing our bread, let “service” mean nothing more or less to us than “pass the jam, please” as we eat around a common table with our brothers and sisters whose acquaintance we tragically have yet to make. As my family shuffled into the mission, all of the staff and volunteers noticed us, but none of the poor did. We were just one of the throng that was waiting to be served. We sat down as a church service was being administrated, but very few of men and women paid any attention to the beautiful songs that were being sung. Some people read, others stared blankly into space and one man even openly rolled his marijuana cigarette (by the way, it is legal now in Colorado). As the staff were serving the food there was very little chit-chat or interaction between any of the people. They only cared about consuming the plate of food and jumping back into the line for seconds. We were able to interact with a few of those around us and this went a long way in helping us understand what they were feeling and experiencing. The whole evening certainly made an impact on our family. I’ll refrain from sharing all of our thoughts and reflections (we spent plenty of time processing everything with our kids afterwards), but I will say that we now understand why serving the poor shouldn’t really be done apart from eating with them. When we’re not interested in building genuine mutual relationships, you rob people of their dignity and they become projects and not people. They become statistics and not reflections of ourselves. How can you love and serve the poor if you don’t even know the poor? Eating with the poor, instead of just serving them, is a simple opportunity for soup kitchens, rescue missions and food pantries to take advantage of. And the same opportunity is available for us as well. Serving and giving money to the poor is very important, but it is not the Work of Mercy of sharing your bread. Sharing your bread means rubbing shoulders with the other person, it means understanding the other person, it means experiencing what they are experiencing and it means engaging in a relationship with the people that you share the table with. But if eating with the poor seems a bit anti-climactic, you’ll be glad to know that it was for Jesus as well! Jesus didn’t stop with the eating and the serving; it was just the beginning of an invitation to the Kingdom of God that he offered. Jesus used the meal to call the participants to follow Him and to leave the life of sin behind (Mark 2:17). Jesus modeled the Kingdom of God by eating together with others. Let’s take his example, and call people into relationship and fellowship with God by first experiencing that relationship and fellowship around the table. This entry was posted in Sharing Your Bread and tagged eating with the homeless, eating with the poor, Mark 2:17, rescue mission. Bookmark the permalink. I will do this, Pastor Tim. I will eat with the poor, and follow Jesus, and, with a new heart leave the entire life of sin. And I’ll proclaim the Kingdom of God in the process…so thankful God did not leave us alone to try to figure this all out for ourselves.